This two-day program is led by BIS's professional counseling staff and provides an in-depth examination of the Export Administration Regulations (EAR). The program will cover the information exporters need to know to comply with U.S. export control requirements on commercial goods. We will focus on what items and activities are subject to the EAR; steps to take to determine the export licensing requirements for your item; how to determine your export control classification number (ECCN); when you can export or reexport without applying for a license; export clearance procedures and record keeping requirements; Export Management Compliance Program (EMCP) concepts; and real life examples in applying this information. Presenters will conduct a number of "hands-on" exercises that will prepare you to apply the regulations to your own company's export activities. This program is well suited for those who need a comprehensive understanding of their obligations under the EAR. 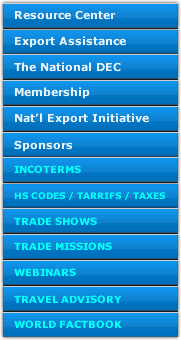 The scope of the Export Administration Regulations. How to determine the export licensing requirements for your product. When you may export without applying for a license. What an Export Management Compliance Program (“EMCP”) is, and how it can help meet your regulatory responsibilities. 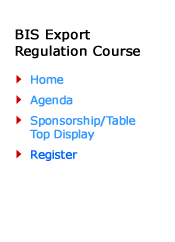 The instructors are experienced export policy specialists, and enforcement personnel from BIS's field offices. The instructors will be available throughout the seminar to answer your questions. The Westin Los Angeles Airport Hotel is offering a special rate of $173 per night until September 7, 2018 to seminar attendees. Booking details will be provided once registration is complete. For registration information, please contact the U.S. Commercial Service’s Export Assistance Center at: (310) 235-7203, or email. For more information or questions on the topics to be covered, please call BIS's Western Regional Office at (949) 660-0144 or email. 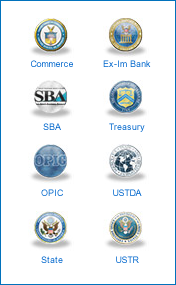 The Western Regional Office of the Department of Commerce, Bureau of Industry and Security is a State Bar of California approved MCLE provider. This course is worth 12 hours of MCLE credit. However 0 hours will apply to legal ethics/law practice management; prevention, detection and treatment of substance abuse and emotional distress; and elimination of bias. Americans with Disabilities Act: If special arrangements are required for a disabled individual to attend any of these programs, please notify the contact person at least one week prior to the program. Substitutions within the same company are available up to the day of the event. No refunds after September 07, 2018. A credit toward a future BIS seminar sponsored by the District Export Council of Southern California will be considered if a cancellation is needed due to extenuating circumstances. This seminar is annual, May in Costa Mesa and September in LA. Direct refund questions to Delia Valdivia by telephone at (310) 235-7203 or by email at Delia.Valdivia@trade.gov. Any refund or substitution request must be made by email to Delia.Valdivia@trade.gov.